The global innovation foundation Nesta has just published Imagination unleashed: Democratising the knowledge economy, a report on building inclusion in the era of radical change shaped by digital infrastructures, networks, services, and products. It’s a compelling document which explores current challenges to our societies and sets out a broad-ranging agenda for addressing them in ways which promote inclusion and equity. Reading this report from an information professional’s perspective suggests a great number of opportunities for libraries and other information institutions to play a part in making a fairer and more prosperous world, where more people get to realise their full potential. In this post, I’m going to talk you through the report, suggesting a few of the implications and opportunities – and I’d encourage anyone interested in the future of knowledge to check out the report alongside this commentary. What is the knowledge economy- and what’s the problem? If economic eras are defined by their most advanced form of production, then we live in a knowledge economy – one where knowledge, embedded in people and things, digital infrastructures, networks, products, and intangible assets, plays a decisive role in the organisation of production, distribution, and consumption. Nesta’s report sets out a vision of the global economy as one that is booming but marred by inequality. Participation in the knowledge economy appears universal, but it is not: rather, it is confined to particular firms, places, and people. Some of our era’s greatest problems can be explained by this confinement: stagnant productivity owing to the failure of innovation’s benefits to spread and a widening gap between the economy’s leading edge and its mainstream; gaps in pay, and opportunity; political disenchantment, as voters become split between “the fast and the stuck, the connected and disconnected”, those who participate in or are excluded from the knowledge economy. The confinement of the knowledge economy confines human potential – denying people the opportunity to express “our distinctive human ability to reimagine the world around us”. For governments and political movements facing such challenges, there’s a temptation to follow familiar responses: reliance on trickle-down from the leading edge; promises of a return to the ‘good old days’ in the form of mass manufacturing jobs and closed economies; or faith that new forms of welfare such as Universal Basic Income (UBI) can be employed to redistribute the proceeds of technological advance. Imagination unleashed, written by Roberto Mangabeira Unger, Isaac Stanley, Madeleine Gabriel, and Geoff Mulgan, explores other routes to an inclusive knowledge economy. the knowledge economy does not have to be confined and contained; that an alternative approach is in reach which democratises it. This alternative strategy […] puts as much emphasis on widening participation […] as advancing the frontiers. Rather than simply compensating the ‘losers’ of the market economy, it aims to transform its institutions, so that many more people, places, and firms can take part in, and shape, the knowledge economy. With centuries of experience in collecting, curating, organizing, and providing access to information, plus a developed system of ethics and values which applies to issues such as privacy and information equity, information professionals are well positioned to serve the knowledge economy of today and tomorrow. A library empowers communities to explore information, knowledge, and culture on their own terms. (You can read more on this in “Anywhere in the universe: a mission for libraries“). Libraries are trusted services and spaces where communities can gather, discover, explore, and discuss the issues that matter to them. The community may be a neighbourhood, or a specialist group of scholars and students, or the staff of a commercial or public enterprise, but the relationship between a community and its information needs is always the focus of the modern librarian. There has been a transition from “shelfy” services focussed on collections of printed material to places of performance, technology, and connection – equally likely to grant access to maker technology, to loan digital materials, or to host communities for performance or debate. and to create a high-energy democracy, promoting experimental government, and an independent and empowered civil society. Universal suffrage and universal education, rights at work, competition policies to break up monopolies, and welfare states: all attempted to mitigate the inequalities of earlier industrial revolutions. Now new solutions are needed for a new era. In each of the report’s key areas, information professionals and libraries have the opportunity to play a significant role as protagonists of change in a global story. This story provides a viable and inspiring alternative to narratives of trickle-down economics or a fantasised retreat into the golden age of an industrial past. It is a story of people taking control as makers, not just as consumers. The economy of the 21st century has many names: knowledge, information, digital, data-driven. It is an economy in which knowledge plays a bigger role as both input and output; and where digital infrastructures, networks, and products, and intangible assets play a decisive role in the organisation of production, distribution, and consumption. The transformations which have led to the era of the knowledge economy are not solely technological, but this age is associated above all with high-technology industry. Technologies such as 3D printers “shorten the distance between productive activity and experimental science”: it’s a short jump from conceiving something to having a go at making it, then developing it into a product. While often the innovations of the knowledge economy are geographically concentrated – with already successful sites like Silicon Valley drawing in new talent and capital, benefiting from the latest technologies – public libraries provide one potential point of access for even disadvantaged communities to access the new instruments of the information age. Many public libraries internationally now host maker technologies such as 3D printers or dedicated makerspaces focussed on hands-on, user-led innovation and exploration of technology. In 2018 I consulted with public libraries in Warwickshire, England on the creation of two “Let’s Make” spaces intended to serve economically deprived areas. These dedicated rooms within existing public libraries are intended to provide services which create pathways to entrepreneurship and develop new skills suitable for local high-technology industries such as car manufacture. In the United States’ Sachem Public Library, experienced makerspace staff are going yet further in exploring how to diversify the ways in which maker devices, software, and services are offered. Makerspaces have traditionally been located in a single, fixed location in the library that is available for patrons of all ages. Although the model of grouping all makerspace technology in one area has been successful, a fixed space can limit how many patrons can access the materials at any given time and limit programming capabilities. Studio technology such as the 3D printer, embroidery machine, robotics, digital art, video production with green screen technology, virtual reality systems, and other items are mobile and can be shared between departments or taken outside the building for outreach. This has implications for the ways in which communities exploit opportunities to make new things happen. 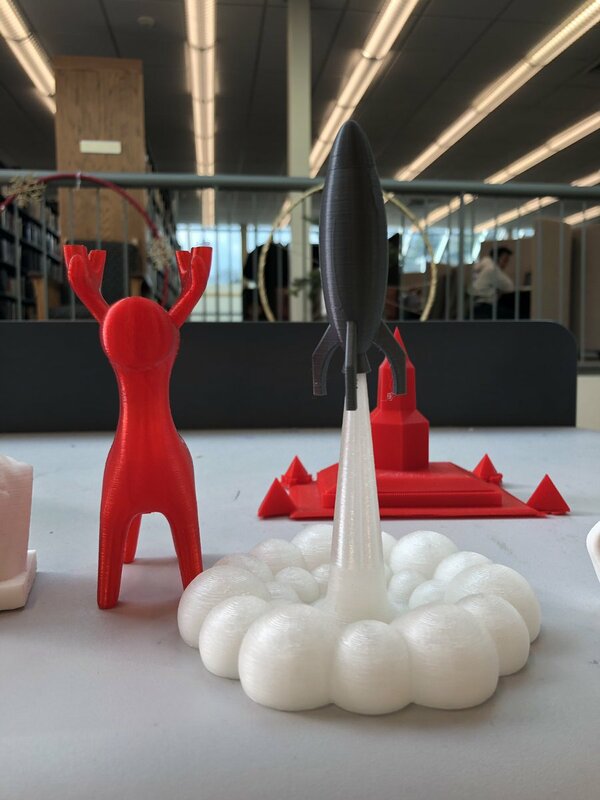 In the Sachem model, novel maker technology is removed from the specially demarcated “makerspace” and integrated into the library’s wider offering, on- or off-site, so that it becomes part of everyday service. This change is as valuable for a corporate or institutional environment as it is for the playful or informal contexts in which Sachem’s users might investigate maker technology. When the distinction dissolves between conceiving and making, initiative is decentralised. Command-and-control approaches won’t cut it any more and participants in production need to find new ways to cooperate. The capacity of libraries to offer a radically decentered approach to knowledge management is one of the benefits they offer communities in the information age. This relates to the ways in which libraries have traditionally focussed on exploration, not instruction. It’s not just about technology, it’s not just about access to data. The way we learn, individually and together, will have to change too. That applies to so-called “soft skills” as well as every other domain of knowledge. Imagination unleashed acknowledges that current education systems prepare people for the economy of the past, not the future. The report points towards a coming world where repetitive jobs and those which demand physical strength are likely to disappear, but those requiring collaboration, creativity, and judgment will likely grow in demand. In the workplace envisioned by the Nesta report, teams must organise fluidly, with less division between the roles of supervision and implementation – “teams need latitude to organise their work”. Exploration of information, knowledge, and culture doesn’t just mean reading, viewing, or learning; it can mean making, experimenting, performing. […] Libraries are places for surprise and discovery, not predetermined outcomes. Even when engaged in an unserendipitous act like seeking an item from a college reading list, or revisiting a book read once before, a reader has the capacity to surprise themselves and others: they are seeking something which they do not know or fully recall. […] Great librarians are not teachers or preachers, inflicting lesson plans, assessments, doctrines, and dogmas on those they serve – they avoid the instructional paradigm wherever possible, surrendering command and control to the user if they can. […] Librarians may devise learning opportunities to help the explorers they serve – approaching the territory of the teacher via the middle ground of educational design – but they are distinct from teachers, and that distinction lies in the power dynamic between the librarian and the learner. Librarians already offer the kinds of collaborative and exploratory approaches to learning advocated for in Nesta’s report, and these can be expected to evolve as technology and artificial intelligence shape the world of work and everyday experience. In addition, the Nesta report emphasises the need for “lifelong learning” to become more than just a buzzword but a serious strand of education alongside traditional primary, secondary, and tertiary institutions. The library, which already offers courses to all ages for its community, stands ready as a site for investment and development in this role. This has an impact not just on education itself, but also the model of welfare proposed by Nesta’s report – a “social inheritance” giving security in times of change, with an increased focus on reskilling to meet the fast changing needs of the knowledge economy. That kind of social inheritance, designed for an information age, might well be the kind that you claim not at a benefits office, but at a public library. In the future, the kinds of problem-solving we come to value at work may surprise us. Will accountants’ work succumb to machine learning before that of the plumber who has to visit your home, figure out why your bathroom plughole is misbehaving, then rummage around in the pipework? Will it prove harder to teach a machine to fold bedlinen than to advise a judge on whether her sentencing has been consistent when the same kinds of crimes are tried in her court? Will librarians themselves be replaced by self-check machines issuing loans or will they find innovative new ways to understand, define, and meet their community’s information needs? In answering that question, they might just end up helping to define the future of education. Imagination unleashed‘s proposals for transforming the knowledge economy and making it more inclusive also include a drive to explore alternative forms of ownership – what they call “unbundling” or “splitting the atom” of ownership – by encouraging alternative property regimes to flourish alongside the dominant model. The established law of patent and copyright is designed to provide incentives to innovation through offering temporary monopoly while requiring inventors to disclose their creations […] In practice, patent law can also inhibit an inclusive knowledge economy. Librarians are already enthusiastic advocates in the field of intellectual property reform. In 2015, Australian librarians took a creative approach to lobbying their government with the “Cooking for Copyright” movement. This sought to reform copyright terms for unpublished works so that they matched those for published works (70 years after the death of the creator). In the past, these works would have remained perpetually in copyright, so librarians found unpublished historic recipes, cooked them, and shared the results on social media to show what the nation was missing out on. Unpublished works included not just recipes but historic diaries, letters, company records, and academic theses – the cookery campaign helped advocate for the government to change the copyright rules which had kept materials locked away to no one’s benefit. More recently, and at an international level, the work of academic librarians to develop the Open Access movement and negotiate with academic publishers in particular is part of the mission Nesta identifies, to encourage a fresh look at the nature of intellectual property. The willingness of information institutions to contend with publisher Elsevier is a sign of their appetite for contributing to the property regimes of the future. Across the current and future knowledge economy, librarians will be found experimenting with and making use of IP novelties such as Creative Commons licences and open source software, and can be expected to play a role with new developments such as varying patent lengths, innovation prizes, and special-purpose public entities in which diverse contributors to a new technology could hold a stake. With the increasing presence of maker technology in public and academic libraries, we might reasonably expect information professionals to be at the forefront of new debates in intellectual property as they apply to material products, too. Sector-specialist information professionals like London’s Oz Ablett will even bring the information’s professional lens to bear on fields such as architecture and the management of larger physical spaces. focus on promoting more conditional and temporary forms of property rights, underpinned by stronger obligations of property “owners” towards the wider social and natural environment. The report authors suggest that the language of “custodianship” be used for this concept. This chimes with terminology used to describe Indigenous relationships with the natural world. Information and culture institutions in nations such as Australia and New Zealand with a long colonial history have begun challenging discussions around decolonisation and respectful engagement with Indigenous materials and practices of knowledge management. A self-critical information profession willing to revise its beliefs, values, and practices as it learns from Indigenous traditions of knowledge (when permitted to do so) could valuably inform future notions of custodianship. In every nation, community, and culture, librarians, with their long tradition of custodianship of knowledge, their familiarity with copyright law and intellectual property regimes, and their recent engagement in the future of academic publishing and open access, bring useful history, skills, and institutional positioning to this aspect of the knowledge economy. Imagination unleashed points out the necessity of democratising data and opening up the infrastructure of the knowledge economy – addressing the power wielded by the so-called “tech giants” and the culture that some have labelled “surveillance capitalism”, where large corporations offer services in return for the ability to monitor, record, and exploit the behaviour of their users in astonishing detail. Librarians, as values-driven information professionals who have even stood up to US Homeland Security against sharing patron data, have a part to play in the challenges identified by Nesta’s researchers. Half the world’s population is now online, but growth in internet access has slowed down in recent years. Getting more people online means addressing physical barriers – investing in broadband and infrastructure – as well as promoting accessibility for users with disabilities and non-English speakers. Libraries around the world provide computers and internet access to their communities; some loan hotspots and technology to be taken offsite; some keep their public wifi switched on after hours so that users can still get access to the internet from outside the building after the staff have closed it for the night. Librarians also advocate for Net Neutrality, or seek out better infrastructure provision for their community: in Australia, where regional areas are plagued by poor broadband provision, some public libraries have negotiated to be given access to a faster broadband network designed for universities and research institutions. Librarians also connect with other partners in this field: the Catalonian internet provider Guifi.net, which serves rural areas that mainstream providers do not reach, was invited to present at the IFLA President’s Meeting of global librarians in 2018, for example. Imagination unleashed also calls for new models of data ownership, identifying them as a priority for institutional and legal reform. “It is […] an important principle for a future knowledge economy that data should be under the control of the individuals who generate it,” so that it is not in the hands of giant firms who have little incentive to use the data in their possession, except for economic gain. Libraries around the world are exploring new roles as trusted custodians of public data, which might form the core of the new models Nesta’s report calls for. In Canada, Toronto Public Library is being considered as a potential holder of such information for smart-city projects; in Norway, the library of Stavanger is partnered with the small tech firm Bolder on a city-scale project to give citizens control of their own information, sharing it on their own terms. Increasing people’s control of the data they generate also lets them make informed decisions about when to share it for broader communal use. And while such future-facing proposals and experiments are being advanced, libraries are also dealing with the challenges of the here and now. The Dutch library innovation unit Frysklab is translating and adapting a “Data Detox Kit” originally designed by Berlin’s Tactical Tech collective: this eight-step plan empowers library users to consider their data footprint and who they are sharing their personal information with, returning informed choice and control to the individual where possible. Public institutions, too, will benefit from librarians’ support as they take control of their data and make use of their ability to share it judiciously. The open data movement and projects based on making community information available to all, such as hackathons, will require information professionals who host testbeds and sandboxes where newcomers, innovators, and members of the public can use experimental methods to find what works in solving the problems of today and tomorrow. depends on higher levels of trust, within and between firms, as well as among other stakeholders, including government and consumers. Experiments and testbeds, for example, work best where there are strong relationships of trust between firms, government, and the community. Librarians’ established high level of trust among the community could be especially valuable in this context. Last year, in Norway, I proposed a challenge prize which used the public library network to extend the reach of the nation’s innovation agency, leveraging the trust and geographical coverage of libraries to offer a more inclusive approach to finding Norway’s brightest ideas. So how will this all work? The report authors acknowledge that the implementation of these ideas will vary according to national histories, cultures, and institutions. This chimes with the Review of The Next Horizon consultation report Dr Kate Davis and I wrote for the State Library of Queensland, Australia last year (PDF download). deeply local […] part of the community it serves. […] The future public library is deeply connected to its community and their needs. It focuses collections, programs and services on the needs of the community and takes a customer-centric view of its operations. Library staff know their community well, both formally and informally. They are well acquainted with evidence, data, and demographics, but their work goes beyond transactions to develop meaningful and lasting relationships with the people they serve. Innovation in both the information profession and the wider knowledge economy must unfold within its local ecosystem – the transformation of our society’s relationship to knowledge will not happen in a single wave or an imposition from above, but a process that is piecemeal and perhaps eccentric. Institutional and ideological orders are ramshackle constructions. They change, and we change them, step by step and part by part. Fragmentary, piecemeal, and discontinuous change is not only compatible with the transformation of such structures; it is close to being the only way in which they change. This means that small local projects and limited experiments can be of benefit in provoking an overall systemic change. It also gives new meaning to William Gibson’s observation that “the future is already here, it’s just not very evenly distributed”. This quote does not mean that there is only one future, which has already been decided for us, merely waiting to roll out from the big metropolises and centres of power, from Silicon Valley, or New York, or Beijing. It means that some of our potential futures may resemble conditions which are already unfolding elsewhere – for example, to see how widely available, high-speed broadband might affect society, one could visit South Korea, where that has been the situation for some time. Librarians and information professionals might benefit from considering their possible futures and investigating communities around the world who could already be experiencing some of the conditions which await. Deeply local transformations give hope, inspiration, and possible routes forward for others who seek to transform their own setting. The UK’ s Libraries Unlimited offers one example: in a time of widespread cuts to British public libraries, this service in South West England spun off as a public sector mutual with 50 branches. Redefining and reinvigorating public library service for the 21st century, it is not a “copy and paste” model for every community, but it demonstrates new options for the beleaguered information institutions of Britain. Nesta called the thriving service one of their ‘New Radicals’ of 2018. This work of local experimentation – and learning from other examples without merely copy-and-pasting – matters greatly, because it is the way to ensure that a singular future is not imposed on us. Other routes are always possible, if only we can imagine them. Americans resisted the idea that the formation of large landholdings, and the expulsion of smallholders from the countryside, was intrinsic to the development of ‘capitalism’. Federal and state governments did much more than redistribute public lands to families ready to till them. They organised the institutional machinery and economic instruments of efficient, market-oriented agriculture. Land-grant colleges helped to ensure that agriculture, even at relatively small scale, could benefit fully from the most advanced science of the time. Economic and legal tools such as minimal price supports, food stockpiles, and crop or income insurance, were used to safeguard family-scaled agriculture against price volatility and climate volatility. What would this kind of attitude, this provision of support and security, look like for the wildly different terrain of a knowledge economy? To find out, it is necessary to remain hopeful, to research thoroughly, and to take action, experimenting and seeking the best possible future. A spirit of experimentation must be encouraged and accompanied by measures designed to protect and safeguard the community, so that they remain unafraid in the midst of rapid and uncertain change. The more one knows and discovers, the easier it is to make the next discovery. If the process of production can be organised on a model of scientific inquiry and experimentalism, innovation can stop being episodic and become permanent. There is fear, in this moment of change, that human beings could be “replaced by machines” in some aspects of their lives, and that this could be experienced as a terrible loss. Nesta’s report reminds us that human beings differ from machines in our capacity to imagine. Digital devices may take up jobs we did in the past, but they can only do the things which we have learned how to repeat – and which we can teach them how to repeat. In the healthiest possible futures for the knowledge economy, human beings and machines don’t become interchangeable, they diverge. Human beings must be unlike machines, escape formulaic thinking, displaying instead “foresight, vision, and the ability to imagine what is not already there”. The report’s authors write that “[t]he power of disruptive imagination needs to be unleashed in every citizen”. If we’re going to do that, and help our communities to solve the problems of today and tomorrow, to realise their full potential, the library has a leading role to play. The report’s vision is of a change which is cumulative and experimental, rather than sweepingly revolutionary or reformist. It is of a change which is girded by safeguards and social inheritance. In this scenario, the library is a comforting, familiar, trusted place, directly connected to our legacy and heritage via its role as the custodian of knowledge and culture. The library is an information institution, whose primary purpose is to give people access to knowledge, information, and culture on their own terms, one which has long supported lifelong learning and which offers an exploratory paradigm which supports rather than controls the learner. The library is a place which has changed before – to accommodate new technologies, new hierarchies, new ways of being funded, new ways of living – and it’s one which is ready to change again. The library is a physical and virtual space where grassroots movements, experts, innovators and big institutions both private and public can all meet. It’s a place where education can be reframed as exploration rather than instruction. It’s a place where a tradition of welcome for all and access to information provides a launchpad for the next evolution of our societies, our economies, and our relationship to knowledge itself. For the library user who comes to support the development of their infant child’s literacy at a storytime, who comes to seek out information on shelves or a screen, who seeks solace or inspiration in a movie or a novel, or seeks connection in a community event; for the library user who is looking for a technological innovation, using digital tools like the 3D printer to test their own bright ideas and bring them into the world – for all of these people, no institution has a greater role to play in unleashing their imagination than the library of today – and tomorrow. Read “Imagination unleashed: Democratising the knowledge economy” at the Nesta website.